Real quick, I want to share with you a giveaway over at my friend Colie's blog. I totally dropped the ball on this one. I really should have mentioned this giveaway sooner, but stress got the best of me. Sorry, guys! 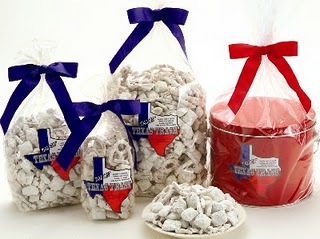 Welcome to Colie's Kitchen has teamed up with Susie's South Forty Confections to give one of her lucky readers some Pecan Toffee and Texas Trash! Colie is offering you 10 chances to win this tasty prize, so hurry over to her blog and ENTER! Giveaway ends on August 4th at 10:00 p.m. EST.